Team GBR's horses may not be flying out to the World Equestrian Games (WEG) until mid September, but their feed is on its way. This week, supplies of HorseHage — which has supplied the British equestrian team since 1984 — was loaded into containers and has set off for Kentucky. The team at Fox Feeds Ltd in Hertfordshire, a regional licensed HorseHage producer, pitched in to load a container with High Fibre HorseHage and Rygrass. It will be now be shipped out to the US in advance of the Team GB horses' arrival. While searching through the internet one evening looking for shows to take my horses to I came across a link to the Scottish endurance riding club (SERC) and noticed an event taking place at Scone palace which is not far from us at all. 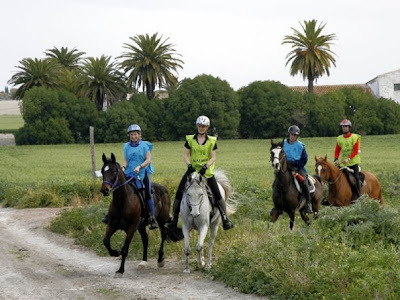 I have had a number of people asking me over the last few years about the suitability of friesian horses for endurance, although I see no reason why a Friesian could not be used for endurance riding I could not say that I knew of any as I had never taken an interest in this sport. I read through the SERC website and thought this may be the perfect opportunity to give it a go as the Scottish championships were to be held from the 16 and 18th July at Scone palace. Alison has become an expert in not only getting herself fit and her diet but in carrying lightweight articles of all clothing. Nicky has had many a conversation on this with her and it is quite incredible what you can get. Alison works in the NHS and has got a lot of support from fellow work mates and so we are now asking you to put your hands into your pockets and supporting Alison by giving a few pence towards her success and helping our team in their quest in Kentucky. Ya han sido comunicado los resultados de los once controles Antidoping que se realizaron en el V Kaliber-Andalucia. Los resultados de todos ellos han dado NEGATIVO. They have already been communicated the results of the eleven drug test conducted in the V Kaliber-Andalucia. The results of all tested negative. THE West Riding group of Endurance GB is holding its first event of the season at Wharncliffe Chase, near Sheffield, on June 12 and June 13 There will be something to suit all abilities, from an 80km competitive ride to a 27km pleasure ride, in aid of the Yorkshire Air Ambulance.